I may as well be honest from the outset. 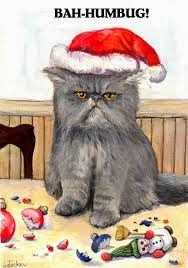 I am not a huge fan of Christmas. There are lots of reasons for my bah humbug-ness starting with the obvious and a few reasons known only to myself. It is all over and done with once The Dinner is finished. A whole 6 weeks of manic, feverish preparation wiped out after a few roast spuds and slices of turkey. I didn’t always feel like this. I used to love Christmas. Especially the build up to it all. Christmas Eve was brilliant – a time for last minute shopping. Usually for myself. I loved finishing up work for the holidays. I loved the hustle and bustle of it all. Other people’s hustle and bustle that is. I always had everything bought and wrapped by December 1st, giving me the rest of the month to enjoy the atmosphere. And to pity those who weren’t as organised. I loved socialising. I loved how everyone was always in great form. The banter, the bonhomie, the Christmas drink/s; I loved it all. All is not lost however. There is one day in the run up to Christmas I love. Tomorrow is that day. Or to be exact, tomorrow afternoon and tomorrow night is that day. See, a family member will be celebrating a milestone birthday soon and tomorrow night is the night we get together to do that. I have to do other stuff first like grocery shopping, take the dog for a run, buy runners, buttons and hard card to make Christmas cards for people. Then, then I will be getting my hair done. I love that. After which I will enjoy a leisurely hour or so looking at make-up and shoes. I won’t turn around to find four children and one man looking at me looking at shoes and make-up. Also a purchase or two is very likely to be made. I will grab a bottle of wine for those all-important pre-meal drinks. Go home and get ready to go out. I can’t wait. Ican’twaitIcan’twait! I CAN’T WAIT! And hopefully I will have some of the following on Sunday morning.